A meteorological phenomenon causes a hot dry wind from the Mediterranean to blow north across the European Alps and has long been thought, according to local lore, to precipitate erratic behavior in humans. Known as the foehn, there is scientific research that suggests the associated behavioral changes may be caused by the electrification of positive ions in the atmosphere. A natural phenomenon is also responsible for crazy behavior on Martha’s Vineyard. I have studied it. Weather is not to blame – it is the arrival in late summer of schools of bonito and false albacore. It is a fish foehn. Atlantic bonito (Sarda sarda) and false albacore (Euthynnus alletteratus) are essentially mini tuna. Though neither is considered a true tuna – they are both part of the subfamily of fish called Scombrinae that includes all mackerals and tunas – they share the same general tuna shape. The species differ in several respects, including markings and table quality, but share two important qualities that recreational fishermen value: speed and power. The annual Martha’s Vineyard Striped Bass and Bluefish Derby in early September provides a high-voltage charge to the fishing atmosphere that surrounds the influx of bonito and false albacore, two of the four contest species. (The others are the aforenamed bass and blues.) The resulting craziness continues over the course of the six-week contest, which ends the Saturday after Columbus Day. Bonito, commonly referred to as “bones” by Island fishermen, have lateral lines on the upper half of the body. They are excellent on the grill, but as with any tuna it is imperative to bleed and ice them immediately after they are landed. Bonito caught in Island waters average 6 to 8 pounds. The winning fish in the 2017 Derby weighed 8 pounds, 9 ounces in the shore category and 10 pounds, 13 ounces in the boat category. The state record is a 13 pound, 8 ounce fish Eddie Gomez caught on September 23, 2002, at the New Bedford dike. False albacore, also known as little tunny (and as bonito in Florida, but what do they know), are called “albies” on the Island. The albie has a rounder face and is easily distinguished from a bonito by the wavy fingerprint-like markings on its back and yellow spots around its pectoral fin. There are those who say that albies, when properly prepared, taste great. But that is the same as telling me that a slice of gluten-free pizza tastes as good as a cheesy, gooey slice from Giordano’s – I’m just not buying it. 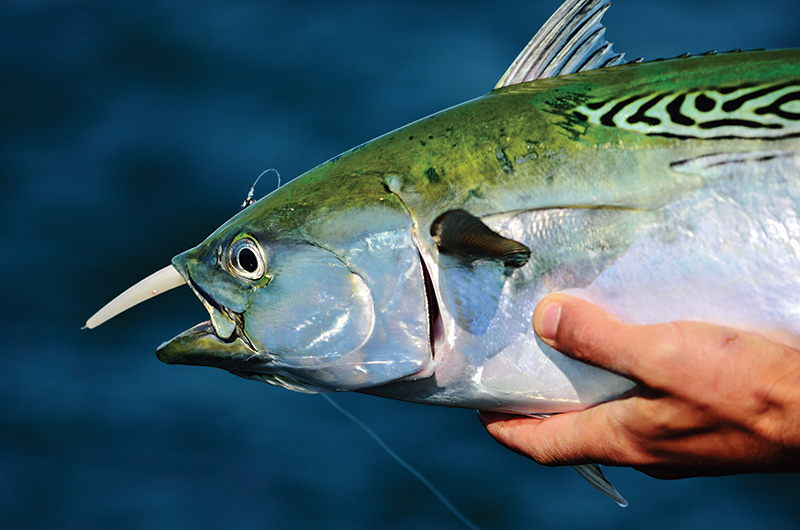 Big albies exceeding 10 pounds can make a run that tops 40 miles per hour – and peel line off your reel just as fast. The 2017 Derby-winning fish in the shore and boat categories each topped 12 pounds. The state (and Derby) record belongs to Island fisherman Donald MacGillivray, who caught a monster 19 pound, 5 ounce albie in Edgartown Harbor on September 27, 1990. There is an addictive quality to hooking one of these notoriously fussy and exciting open-ocean gamesters in inshore waters or from the beach that scrambles good judgment. How else to explain what makes the respectable Dr. Jekyll turn into Mr.
Albie, the guy who clearly sees you have a fish on, but still casts over your line. Or why the normally courteous fisherman in a center console turns into a “bonito bonehead,” who runs full throttle up to a pod of fish breaking just off the bow of your boat. human predator unmindful of everything but his or her prey. And then there is the fact that a fisherman may make several hundred (or thousand) casts without a hit, often landing a fly or lure in the middle of feeding fish, all to no avail. And then you do hookup. It is easy to become unhinged. I heard about the foehn while on a visit to a small village in southern Germany. My host said that its well-known effects had been successfully used as a defense by those accused of reckless and even criminal behavior. Many years ago, the presiding judge in Edgartown District Court tossed a questionable speeding ticket I received at 5:30 a.m. in January when I explained I was on my way duck hunting – Judge Rowe was a duck hunter. I think a fish foehn defense might have some chance of success, but only if the judge is a fisherman.